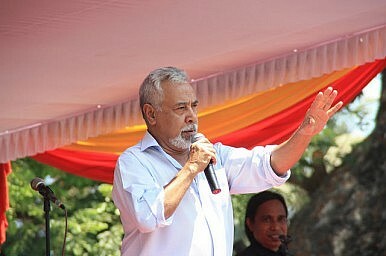 Xanana Gusmao, the prime minister of East Timor, resigned ahead of a planned government restructuring. Xanana Gusmao, the prime minister of East Timor and the country’s first president from 2002 to 2007, resigned the office of prime minister on Friday. Gusmao is stepping down before a government restructuring that is expected to take place next week. Before his political career, Gusmao was a guerilla leader and icon in East Timor’s path to independence from Indonesia in 2002. He has since enjoyed a 13 year career leading East Timor. Gusmao’s resignation was announced by a government statement. “Recently the prime minister encouraged all members of government to work calmly in this time of transition until the new government is sworn in,” the statement said. According to the Associated Press, the move did not come as a surprise; Gusmao had told Timorese lawmakers that he would resign ahead of a restructuring. An anonymous adviser to the former president who spoke to the press noted that Gusmao’s resignation was in part motivated by a desire to pass the responsibility of governing East Timor to a new generation of political leaders. The Timorese government has yet to specify the terms of the restructuring although an announcement is expected next week. Reports regarding the government’s most recent proposal suggest that the cabinet will be slashed down to 34 ministers from a current total of 55. Additionally, the new cabinet will include members of the opposition, leading to a more balanced and inclusive government. Gusmao, additionally, will likely stay on as a minister in the new cabinet. Current media reports do not suggest that Gusmao intends to retire from politics altogether. After declaring independence from Portuguese colonial rule in late 1975, East Timor was invaded and occupied by Indonesia for 24 years. The Indonesian occupation was brutal and resulted in some 170,000 deaths. In 1999, following a referendum backed by the United Nations, East Timor overwhelmingly rejected a special autonomy status within Indonesia and instead opted for independence. The country acquired full independence and separation from Indonesia in 2002.